Benefits of NEGATIVE IONIZATION obtained by the air ionizer 220 IONEX especially in this next period where allergies are at the gates. Contrary to popular belief, the allergies are not exclusive to springtime weather and the outdoors. • In the spring, tree pollen is the predominate cause of airborne allergic reactions. • In the late summer to early fall, ragweed and other weed pollen is the culprit. • Mold spores can bother us through most of the year. Unfortunately, there is no foolproof method or device to completely eliminate the entrance and settling of pollen and allergens in the environment where we live. However, maintaining a clean, healthy, breathable environment of quality air will prove beneficial for all those who live there. For example enriching the air with negative ions can remove, in the environments in which we live, allergens such as pollen, mold spores, dust and pet dander. In fact, the primary effect of negative ions is to eliminate smoke, dust and any toxic substances that pollute the air, they do joining to allergens, which have positive charge, so as to deposit them on the ground, therefore the contaminants are not totally destroyed but simply settle to the ground, of course as usual must then “clean” the floor from what we see but is not is deposited.. 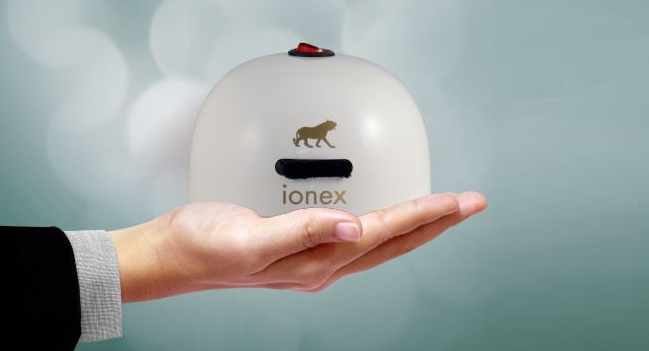 The ionizer IONEX 220 (small, portable, quiet, maintenance-free, ultra-low power consumption and powerful) is very useful because it creates environments where we live, the climate that we find in the mountains or near the falls rich in negative ions.